An old woman at her window in a Nepalese village. Marking World Elder Abuse Awareness Day, United Nations Secretary-General Ban Ki-moon today emphasized that ending neglect, abuse and violence against older people is crucial as the international community continues to work together towards achieving the 17 Sustainable Development Goals and fulfil their underlying pledge to leave no one behind. “Abuse and violence directed at older people take many forms, including partner and stranger violence, psychological and emotional abuse and financial exploitation,” Mr. Ban said in his message to mark the Day. World Elder Abuse Awareness Day – observed annually on 15 June since it was proclaimed by the UN General Assembly in 2011 – aims to spotlight the global social issues affecting elderly people. The commemoration also brings the attention of the international community on the safeguarding of older human beings from mistreatment and suffering. Elder abuse can be defined as “a single, or repeated act, or lack of appropriate action, occurring within any relationship where there is an expectation of trust which causes harm or distress to an older person.” Such abuse can take various forms, including physical, psychological or emotional, sexual and financial abuse, and can also be the result of intentional or unintentional neglect. Noting that older women suffer from age and gender discrimination and are more vulnerable than men, Mr. Ban pointed out that World Health Organization (WHO) estimates show that up to 10 per cent of older people may be affected in some countries. “Abuse of older women often follows a lifetime of discrimination, violence and oppression. I am particularly alarmed by growing reports of older women who are accused of witchcraft, making them targets of abuse from their own families and communities,” Mr. Ban said. Along those lines, the UN Independent Expert on the enjoyment of all human rights by older persons, Rosa Kornfeld-Matte, warned that insufficient action is being taken to stop elder abuse around the world, and called on anyone who suspects such a case to immediately report it. “One in ten older persons experience abuse every month. So, tomorrow it may well be you,” Ms. Kornfeld-Matte said in a statement released by the Office of the UN High Commissioner for Human Rights (OHCHR). The Independent Expert noted that elder abuse occurs anywhere in institutional settings, but often also at home, and it affects older persons across all socio-economic groups. Manifestations include physical violence, sexual or emotional abuse, abandonment, and neglect, as well as financial or material exploitation. “One of the reasons for lack of action is that most people would rather not think of themselves as frail and dependent and, therefore, do not feel concerned. For others, it may be inconceivable that those who are closest to them today – their beloved ones – may be the perpetrators of tomorrow,” she said. “Those concerned – the older persons who are physically restrained, left in soiled clothes, overmedicated or emotionally neglected – may not speak up for fear of reprisals or to protect relatives from criminal prosecution,” she added. Ms. Kornfeld-Matte emphasized that most cases of elder abuse go undetected and prevalence rates are likely to be underestimated. It is therefore essential to continue to raise awareness to help prevent some abuse cases and to ensure that those that take place are immediately reported, she said. Warning signs can include unexplained bruises, lack of medical care, malnutrition or dehydration, unexplained changes of alertness and sudden changes in finances and accounts. “On World Elder Abuse Awareness Day, I urge everyone who suspects a case of elder abuse: report your concerns,” the Independent Expert said. 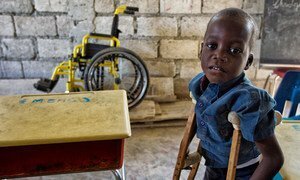 Marking the 10th anniversary of a United Nations treaty that protects the rights of persons with disabilities, senior UN officials today highlighted the critical role people with disabilities play as invaluable partners to achieve the 2030 Agenda for Sustainable Development.